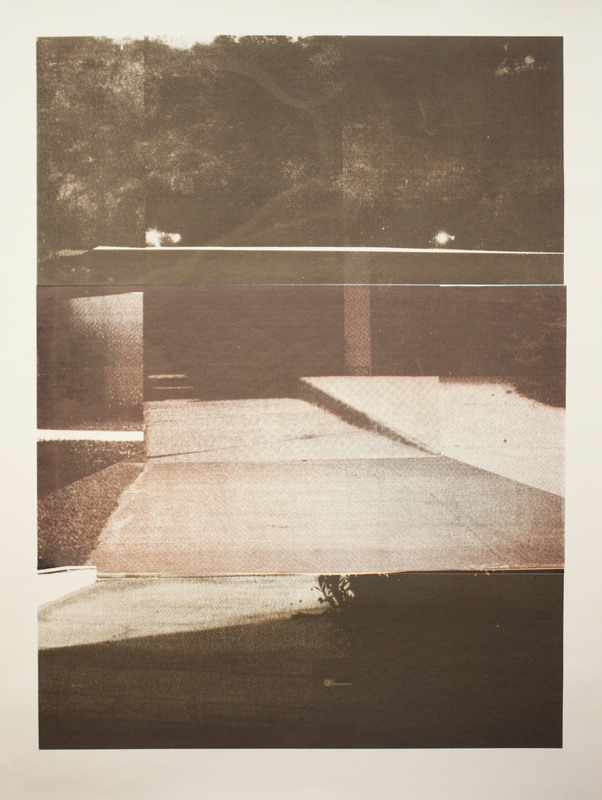 34″ x 46.5″ unframed silkscreen print in an edition of 10 by Megan Berk. For In Stillness This Fiction is Real, Megan Berk’s second solo show at Recession Art, the artist draws on personal photographs, movie stills, clippings from home & garden magazines, as well some of her earliest memories to create works that present an imperfect encounter with grace. A new series of silkscreen prints, created with the generous support of the Lower East Side Printshop’s Keyholder Residency program, reflect the organic surfaces of Berk’s layered paintings and capture the tension in the quietest moments in the home and garden. Megan Berk was born in Los Angeles and currently lives and works in Brooklyn, New York. She received her MFA from Pratt Institute and has exhibited her work at Recession Art, Long Island University’s Salena Gallery, Silas Marder Gallery, Bowman/Bloom Gallery, Scope Art Fair and the German House of the German Consulate. This work is available framed or unframed. Please contact info@recessionartshows.com for details.